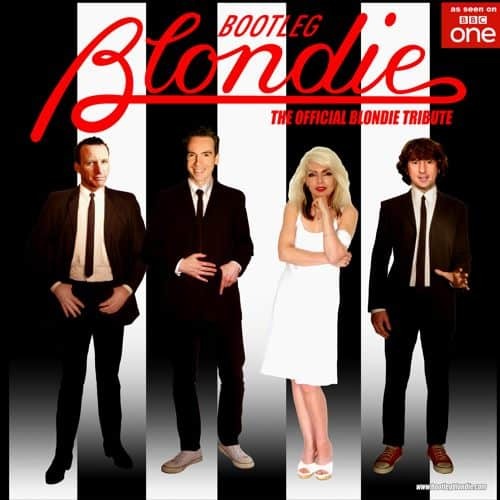 BOOTLEG BLONDIE is the official Debbie Harry & Blondie tribute band, the only Blondie tribute to play the legendary CBGB in New York City before it’s demise in 2006 and unique in that not only have they had the honour to be thanked on Blondie’s 11th album ‘Pollinator’ but have actually toured the UK with one of Blondie’s founding members legendary and celebrated drummer Clem Burke, to celebrate 40 years since the release of Blondie’s iconic album Parallel Lines! We drove nearly 3,000 miles and played to over 4,000 people who were singing along to every word of the songs! Debbie Harris and Bootleg Blondie can be seen at all the major venues and festivals around the UK and Europe having played the Isle of Wight Festival, the 100 Club, the Hammersmith Palais, the Electric Ballroom London, Eric’s Liverpool and have opened for The Undertones, Slade, The Beat, Bad Manners, Heaven 17, Toyah, Hazel O’Connor, Tony Hadley, David Essex, Nick Kershaw and Chas and Dave! In 2014 Clem invited Debbie and Andy to a recording session at the Foo Fighters’ famous 606 Studio in Los Angeles, where they saw Clem and the awesome Neve mixing desk in action which was featured in the 2013 documentary Sound City. Debbie and Andy got married in March 2016 and to their great delight received two video clips from both Blondie and Debbie Harry herself congratulating them on their wedding day. What a wedding present! Debbie Harris, lead vocalist of Bootleg Blondie, has the looks, the voice and the attitude of the original Blondie bombshell and like her heroine is typically outrageous on stage. She has been known to wear dustbin liners, thigh length boots and t.shirts with more holes than t.shirt! Debbie’s pride & joy is her guitar which she plays at every show and is signed by all the Blondie band members. She appeared on two shows for BBC1 when she was picked out of 15,000 applicants to represent Debbie Harry on ‘Even Better Than The Real Thing’ hosted by Paddy McGuinness which attracted an audience of 10 million viewers! Debbie Harris is the niece of the celebrated singer and actress Shani Wallis who played Nancy in Lionel Bart’s musical film ‘Oliver’!